There is lots of chatter on the street with the recently released preliminary budget from the City of Saskatoon, which proposes a 4.5 per cent property tax hike in 2019. That chatter is incomplete without stepping back and looking at a couple of key issues. Those two issues are residential and commercial tax ratios, and the ongoing cost of city infrastructure growth. Here’s an example to explain what this ratio means: the average ratio of the 11 cities in the report was 2.9. 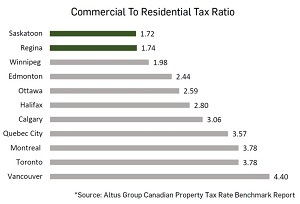 A residential property valued at $1 million would incur taxes that were 2.9 times less than a commercial property of that same $1 million value. When we compare the numbers for our two Saskatchewan cities to other urban centres, we discover this is one of many factors which contribute to creating a vibrant business community. In an earlier post, I discuss the strain imposed upon city infrastructure that is caused by growth. Property tax increases are required to keep pace with inflation and to provide the additional cultural amenities to make our Saskatchewan cities even greater. Looking at other major urban centres can be helpful to determine what we are doing right, and what we could do better. 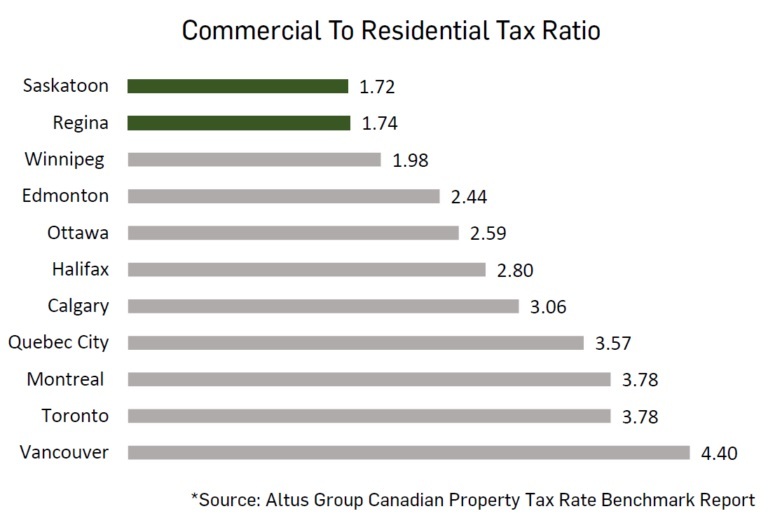 We’ve got the tax ratios right! Now let’s explore what other jurisdictions are doing to contain infrastructure expansion increases.